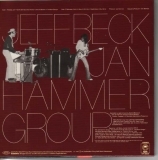 This live album for the 1977 tour features Jeff musically sparring with Jan Hammer. It contains great versions of 'Freeway Jam', 'Blue Wind' and 'Scatterbrain'. 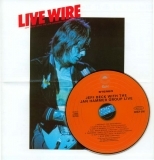 Released in Japan as "Live Wire" (due to it's proximity to the studio "Wired" album rather than the content - contains 2 tracks from "Blow by Blow" and only one from "Wired": "Blue Wind" written by Hammer along with 3 other Hammer tracks). Inserts (as per original):4 by 2 folding poster / bio sheet. The inside shows a biography from birth until 1976 (in Japanese). 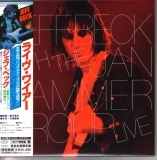 The outside (front and back - 2 by 2 each - pictured) shows the same image as the obi on one side and four portraits with track listing (cropped from top of image) and original production credits (in English).